The Society of Biblical Literature, in keeping with its mission to foster biblical scholarship, is pleased to sponsor, in association with Logos Bible Software, a new, critically edited edition of the Greek New Testament. 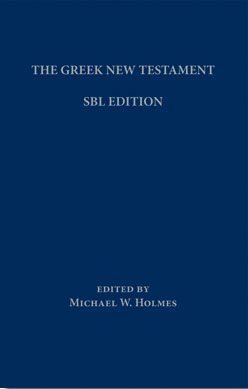 The SBL Greek New Testament (SBLGNT) will be useful to students, teachers, translators, and scholars in a wide variety of settings and contexts. The SBL Greek New Testament differs from the standard text in more than 540 variation units. The existence of an alternative critically edited text will help to remind readers of the Greek New Testament that the text-critical task is not finished. Moreover, by reminding readers of the continuing need to pay attention to the variant readings preserved in the textual tradition, it may also serve to draw attention to a fuller understanding of the goal of New Testament textual criticism: both identifying the earliest text and also studying all the variant readings for the light they shed on how particular individuals and faith communities adopted, used, and sometimes altered the texts that they read, studied, and transmitted.